People always ask me why I blog. And I have my standard answers: (1) to learn about one of the many amazing Web 2.0 technologies; (2) to utilize diverse communication media; (3) to focus my leadership thoughts and hone ideas; and (4) to be transparent. Some have suggested I have ridiculous and selfish reasons like entertaining the public or promoting myself. So, be warned you may want to skip to the next item in your RSS Feed because this blog is for me – for my selfish purposes. This is just a conversation. Perhaps no purpose and perhaps no value to you … but of value to me and maybe to the 108 men and women who work in my organization. Something didn’t go my way recently … boo-hoo. No more whining. Whining (as well as sleeping) is for wimps! As I stood on a sidewalk outside of the <?xml:namespace prefix = st1 ns = "urn:schemas-microsoft-com:office:smarttags" />Las Vegas McCarran Airport, I got another discouraging email from my Deputy, Mark. Since I was already preparing for glory by putting my life savings on #11 black, I told him to schedule an All Hands Meeting. I’ll tell the staff the bad news myself – if I come back. As young managers, we spend a lot of time understanding new and unique ways of motivating our workforce. As seasoned leaders, we find ourselves in a position to lead and motivate even more people to do greater things and yet must somehow … someway … find the inner strength, courage and stamina to motivate ourselves even in the face of a setback or a defeat or even death. So I stayed up until 1:30 am preparing a power point presentation for my All Hands Meeting. All the right motivational words; the right context; restate the IT vision for the future (for the 5,000th time). I’ll spell check later. Time to say my prayers and try to get a little sleep. By the time I woke up in the morning, my thoughts drifted to the movie 300. So I decided to throw away the power point, but now, I had no clue what I was going to say to keep my folks motivated and engaged. The movie is a fictionalized retelling of the Battle of Thermopylae circa 480 B.C. In the movie, 300 Spartans, united with courage and fortified with geographic advantage, take a stand and are barely defeated by a Persian Army of over 100,000. This battle buys enough time to create political support for the creation of a Spartan-Greek alliance that eventually defeats the King of Persia. Just 300 Spartans. I thought of the 108 employees in my Directorate. I hate to even call them employees – I work for them instead. I think a better term is to refer to them as the 108 Spartans in my Directorate. 300 Spartans facing death? 108 NASA men and women facing change? Different yet non-trivial events. Change and death. Most change management professionals will tell you that people resist change because of fear. And fear of death is similar to fear associated with change. As we go through change, as individuals or as organizations, we must be prepared for flesh wounds or setbacks. Leaders must prepare themselves and their organizations for change. There was a great scene in the movie where a Spartan soldier got his eye gouged out. His leader asks if he will be ok with that little scratch. The soldier says, no problem, I have a spare. As leaders prepare themselves and their organizations for glory, we all must be prepared for the inevitable little scratches. Yeah, this blog’s for me … and the 108 brave Spartan men and women who work in Goddard Space Flight Center’s IT and Communications Directorate. Today, we prepare for glory. I remember as a child not really wanting to go outside and play because of all of the dangers there compared to the comfort of the fortress of solitude of my bedroom. One of the things I was always afraid of was being stung by a bee. And then it happened. I finally got stung. At first, I was like George in the poem … “I never should have gone outside!” But, then something else happened – once I got stung, it just wasn’t that scary anymore. Oh, it hurt, but it didn’t kill me. Humm, sounds like IT Transformation to me, or more generally, leading organizational change. Destiny brought this poem to me on the heels of getting stung pretty badly while leading IT change at Goddard Space Flight Center. Something didn’t go my way. I reacted like Fred this time – what am I being punished for when I am doing what is being asked of me? What did I do wrong? So, I simply did what any seasoned and mature executive would do – (1) cried; (2) drank cosmopolitans in large quantities; and (3) went to Las Vegas for the weekend. I recall a wonderful panel of CIOs that I had the pleasure of listening to. Two of the CIOs had both left the government, but had been CIOs of the same Department. They were talking about the bane of every CIO’s existence – consolidating email infrastructure. The first CIO said, that as he looked back to see what his successors did, he wished that he [got out of the bed] started that initiative knowing that it needed to be done. The second CIO said, yes, he started it, but he got treated so badly by the Department for doing what was asked of him [he was being punished] and was weary. I admired their candor and admired that they shared their leadership lessons. And I learned about bees that day. So, I’ve dried my tears, sobered up, and didn’t hit the jackpot, but I learned another lesson about bees and I was reminded of something I learned about change leadership. It stings. Most traditional organizations are designed for efficient performance. And this is fine during times of stability and certainty. However, during turbulent and uncertain times, where adaptability and fluidity are needed, the Learning Organization is more effective. As leaders and as citizens, we have certainly seen the evidence of turbulence and uncertainty. Furthermore, many have been asked about how to promote creativity and innovation in government – said another way, how do we create learning organizations in the federal government? I’ll offer two thoughts for how leaders can do this in today’s environment and how CIOs can help. (1) Unleashing right-brained thinking in the workplace; and (2) using technology as a strategic asset that can promote collaboration. Right Brain versus Left Brain. If we are to make ourselves more fully available to the unfathomable potential of our whole mind, we must unmuzzle the genius of the right [brain]. It’s probably better said that we need to have information as a strategic asset and for IT to help enable people as strategic assets by promoting information sharing and collaboration. In traditional organizations, information is used a power. As the amount of complex information in an organization grows, formal systems are established that help detect deviations from standards and goals. In learning organizations, information helps promote an environment where employees have complete information so that they can act quickly. Information is used to promote open channels of communications and create opportunities for discussion. Clearly the actions of an empowered workforce in touch with each other, their customers, their suppliers, and even their competitors help identify needs and solutions needed for success. Collaborating with our competitors can help us learn and adapt and thrive. Here’s where Web 2.0 technologies thrive. The opportunities are immense. We can’t lose sight of the need to measure and comply, but we have to evolve past that and apply these technologies strategically. I will conclude with an ironic situation that I was in. I met a person that was an advisor to one of my colleagues. He had fabulous ideas about implementation of Web 2.0, but here’s the irony – he was a Paleontologist. I thought of the dinosaurs, and how we can learn from them and their inability to learn and adapt and subsequent extinction. Such is the future of organizations that fail to do likewise. As government leaders, we can’t let this happen. We have to promote learning not only in our organizations, but in ourselves as individuals. Did You Hear the One About the NASA CIOs? So, here it is. Q: How many NASA CIOs does it take to change a light bulb? A: None, it’s a hardware problem. If you like that, here’s a better one. 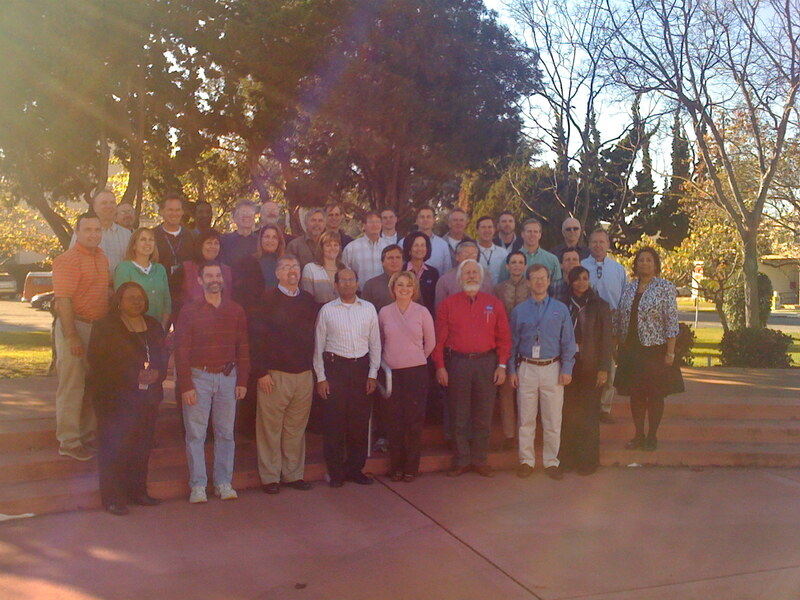 Q: How many NASA CIOs does it take to change NASA? A: All of them. Just look in the picture here and count them. Much has been said and written about the state of IT at NASA. And I have said before that the road to “you-know-where” is paved with well-intentioned and capable NASA CIOs. But, for all the well-meaning suggestions and plans, it all boils down to three things. Working together through good IT governance. I’ve only been at NASA a meager three years, but I already have a gut feeling not of 10 healthy Centers, but 10 poor strugglin’ Centers. As we work together through a Federated Governance, we will be able to unite to develop our common defense, promote our Centers’ unique capabilities, and ensure that IT helps NASA successfully fulfill its mission. Managing a diverse and complex infrastructure. Just as workforce diversity helps organizations obtain a competitive advantage, technological diversity helps enable breakthroughs that are needed in a scientific and engineering environment. And just as 21st century leaders need the competencies to manage and lead in today’s diverse workplace, 21st century CIOs need the competencies to manage and lead in a technologically diverse environment. One size doesn’t fit all, for sure … and 55,000 sizes don’t fit 55,000 either. Somewhere in between there are sweet spots that are mediated by good governance. Leading change and leading people. IT security challenges, and tight budgets, and mission relevance … lions, and tigers, and bears … OH MY! We’re in a pickle. So, what do you do when you’re in a pickle? You eat your way out, right? No, we LEAD our way out. Leadership skills are the “ruby slippers” that will bring it all home for us. We will rely on leadership competencies such as courage, vision, and business acumen … just to name a few. And we will rely on our ability to lead and influence not just the folks we manage, but to influence an entire Agency. So, did you hear the one about the NASA CIOs? No, this is not a joke. It’s a challenge. And the men and women in this picture are the ones that showed up and will suit up to meet that challenge. Author Linda CuretonPosted on February 1, 2009 June 14, 2013 Tags CIO Leadership, IT Transformation, Technology5 Comments on Did You Hear the One About the NASA CIOs?